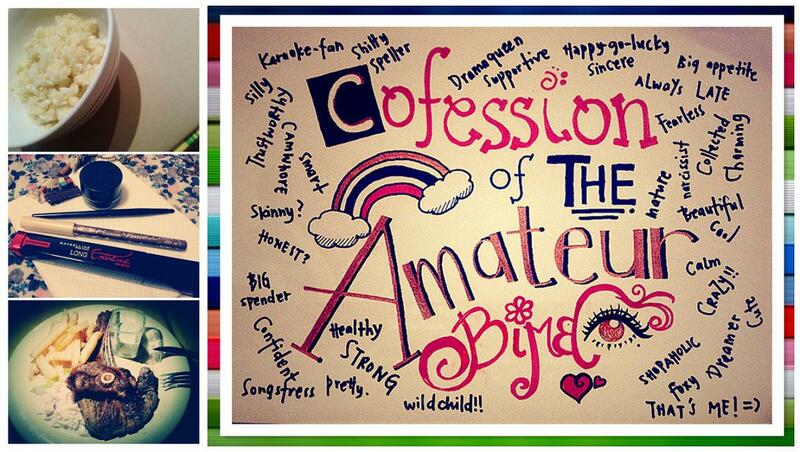 Confession of a Stubborn Bimbo: Ten makes the man Watch2Win!! Ten makes the man Watch2Win!! So here's a chance for you to win an iPad. Not just any iPad, THE NEW iPAD!! You know how they always say it's as easy as 123? Watch a video, and follow the instructions to win. You can start by watching the video here. Now, head to this link for the details. This contest is open to all Malaysians with a Facebook account. Employees and immediate family members of the Organiser, their advertising agencies, affiliates, subsidiaries, agencies and suppliers are not eligible to participate in the Contest. 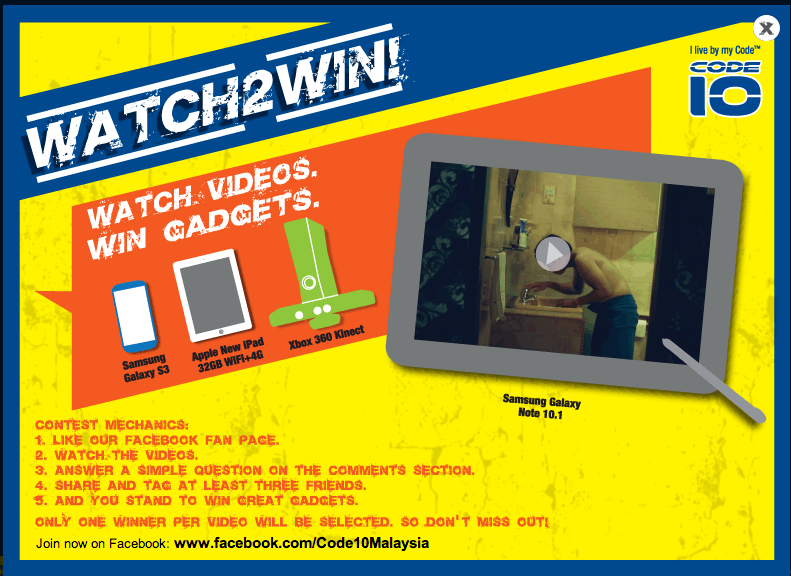 To be eligible to take part in the Contest, contestants must first become a fan of the Code 10 Malaysia page on www.facebook.com/Code10Malaysia. Contestants must watch the video, answer the question and complete a slogan for each video to be eligible for the prizes. Each question requires an answer and a slogan of not more than 10 words. The contestant with the CORRECT answer, along with a creative and unique slogan will be deemed the winner, as chosen by the Panel constituted by Code 10 Malaysia. Decisions made by the Panel will be final and binding. Code 10 Malaysia is not required to share the process of inclusion, exclusion or selection of candidates and winners for the contest. Winners will be notified by any means adopted by the Organiser, be it Twitter, phone calls, email, via Facebook facilities or any other means available. If the winner(s) cannot be contacted/has not responded within a period of seven (7) days after notification, a new winner(s) will be nominated. Winners are required to pick up their prizes from Code 10 Malaysia's nominated Agency/Suppliers. A suitable address and contact number will be provided once the winners have been selected. Winners must pick up their prizes within seven (7) days of confirmation. In the situation that a winner cannot collect the prize, the winner may nominate a representative to collect the prize. The winner is required to notify and gain permission from the Organiser in advance before nominating a representative. Code 10 Malaysia will not claim any responsibility for loss/theft of property and/or accident/injury to the winners arising out of unforseen circumstances relating to the Contest or the collecting of prizes. The Organiser reserves the right to change any prize, for a prize of equal value, without any prior notification. Prizes cannot be exchanged/encashed. Samsung, Apple and Microsoft are not official sponsors of this contest. The Organiser reserves the right, at its sole and absolute discretion, to use the details collected, nicknames, names, photographs, voice or voice recordings and entries of the Contest winner(s) and/or representative without first obtaining consent nor making any payment whatsoever to the Contest winner(s) and/or representatives for publicity, advertising, trade or promotion purposes in any media. Contestants releases any rights to any information and materials submitted or used in the Contest to the Organiser. They are giving out different prizes every week. Ted. Should you watch it?